Before the 18th century, villages were almost unknown in Scotland, apart from in the south east. The typical rural settlement was a hamlet, known generally as a 'fermtoun'. This typically consisted of the houses and farm buildings of four to eight households. Where these fermtouns were associated with a church or a mill, they were given the name 'kirktoun' and 'milltoun' respectively. Surviving 'toun' names are especially common in east-central and north-east Scotland, though no longer as multiple tenancy farms. 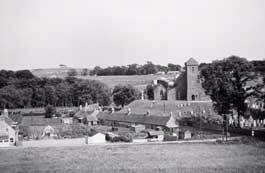 The kirktoun of St Vigeans has now been all but swallowed up by its neighbour, the burgh of Arbroath.